A review of the Central State Archive of the Republic of Kazakhstan (Центральный государственный архив Республики Казахстан / Қазақстан Республикасы Орталықмемлекеттік мұрағаты), Almaty, Kazakhstan. 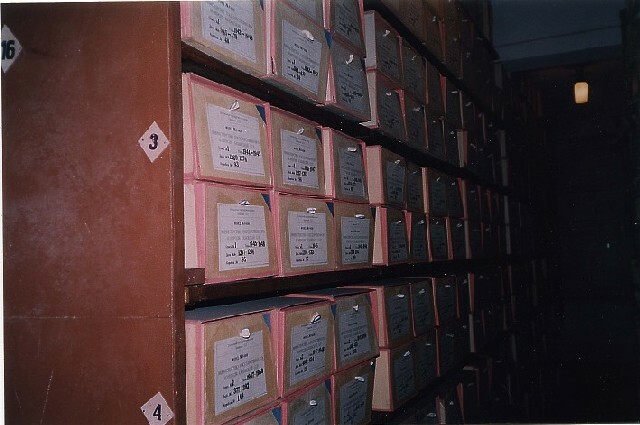 Kazakhstan’s Central State Archive (TsGARK) is the largest archive in the country, and essential to any researcher working on Kazakh history. With almost two million dela, the archive mainly covers the Soviet and pre-revolutionary periods, and has particularly strong holdings relating to nineteenth-century imperial administration, thanks in part to the amalgamation of material from other tsarist administrative centers, especially Omsk. Useful additional fondy relate to the personal papers of a whole host of politicians, artists, writers and scientists. In addition, the Kazakh government has funded schemes to make copies of sources stored in archives outside Kazakhstan, most notably from RGADA, RGASPI and GARF in Russia, which are now kept in a special fond, R-2300. The overall richness of the archive is augmented by the variety of languages which are represented in the fondy – mostly Russian, but with significant quantities of documents in Turki, Kazakh, Mandarin and Manchu. I spent a month using the archive during summer 2013, as part of my research into the visual representation of Turkestan and Semireche in the late imperial period. I would thoroughly recommend TsGARK, both in terms of the material available and accessibility, the latter of which cannot be guaranteed at some archives in Central Asia, especially in the case of foreign researchers. Registration is a fairly painless procedure. You will need a letter of introduction from your university or affiliated institution, along with your passport. Take these documents to the Director’s office on the first floor (room 206). The ladies there will alert the director to your presence and take a copy of the letter. Then there will most likely be a short interview with the Director himself, who will ask you about the general themes of your work, and what types of material you plan to use in the archive. Next, go to the reading room, located on the right hand side at the top of the main staircase on the third floor. The office to the right, at the far end of the reading room is where all administration takes place, along with the ordering and distribution of material. Here you will be given a registration form, with the usual information to fill out — name, address, institution, research topic, timeframe — and a copy of the archive’s rules to peruse. After this, you are free to start finding and ordering material. Staff in the office have very helpful printed guides to the fondy,and can offer assistance if you tell them roughly what time period you are researching. Full lists of the fond numbers and titles can also be found on the archive’s excellent website (English is not available), which is useful in cutting down on the time spent doing this in the archive if you take a look beforehand. To order opisi and then individual dela, ask for order forms in the staff office. There is a separate form for both types of material. All orders usually seem to be ready by 11.00 the day after requests have been submitted. When ordering individual files, note that you need to write down the relevant years and the number of pages associated with each dela on the order form — these details can be found in the opisi. You can order up to five files and three opisi per day, but it is definitely worth mentioning to the archive staff if you are on a relatively short trip, as they will allow you some leeway. After you have registered, the daily procedure of entering the archive is very straightforward, and involves far fewer stamps and checks than in Russian archives. On entering the building, walk past the security guard (he will recognize you after your first visit) and turn left. The first door on the left is home to lockers where you should leave your bags and coats, and a friendly woman who records that you have arrived. In theory, you should leave your passport with her, in return for a visitor’s pass, but in practice she seemed to give up on that after my first couple of visits, and was content to just write down my name. In the reading room on the third floor, write your name in the register at the far end, near the staff office. Any material that you have requested can be collected from this office. There is no system of kontrolnyi listok, so simply hand back your files at the end of the day to the same place. There are large cabinets in this office if you want to keep any dela or opisi until the next day. The staff office is usually closed for lunch from 13.00-14.00, but this does not stop you from continuing to work in the reading room. Given the absence of the listok it is also very easy for you to also pop out of the building for lunch too! The archive has a small canteen, located on the ground floor, to the right of the main staircase, where you can order hot meals, salads, bread and hot drinks from a hand written menu. Alternatively, there are several good cafes on the surrounding streets, particularly on Baiseitova and Kurmangazy. Overall, the archive is a great place to work — easy to access, not overcrowded, helpful staff and generally a more relaxed atmosphere than other archives that I have visited in Russia. Beware of taking mobiles into the reading room though — the staff are eagle-eyed and will ask you to leave any offending articles in the lockers near the entrance. Towards the end of your visit, you may be asked to fill in a short ‘interview’ questionnaire, which asks about your interests in Kazakh history, and how accessible you have found the archive. You may also need to write out aplan raboty, where you outline what work you have been doing and which files you have consulted. There are examples in the staff office if you need a guide. Foreign researches are allowed to photograph up to 300 pages of archival material per year. So far this is entirely free of charge, but it seems likely that this may change during the next year. Permission to take photographs is granted by the reading room staff, who may restrict making copies of material deemed to be politically sensitive. You are also not allowed to photograph more than 30% of any one delo, which can be more restrictive than it sounds given that staff count the number of pages listed on the cover of each file (i.e. not including oboroty). From my experience, taking photographs of visual material enclosed in dela was permitted, although not always in the case of some graphic material — sketches, diagrams and some schematics. On a related note, this building also contains the smaller Central State Archive of Film, Photo and Audio Documents. Located on the first and second floors, the archive holds over 250,000 photographs and negatives from the pre-revolutionary and Soviet periods, as well as separate film and audio sections. The staff based on the second floor are helpful and friendly, although given the size of this archive, access is dependent on you finding the right person at the right time. This said, there is an excellent website with digitized records for some of the collections, which can be a great help in identifying which items to order. Image: Photograph by the Central State Archive of the Republic of Kazakhstan.